A Birmingham student has delivered the music lesson of a lifetime, after teaching a group of senior corporate managers how to perform a Beatles hit on the recorder. Kate Allsop, a postgraduate student at Birmingham City University’s Royal Birmingham Conservatoire, was handpicked by global training firm, OTD, to deliver the session to 30 employees of a blue-chip company based in Madrid. The 22-year-old, from Abingdon-on-Thames in Oxfordshire, guided delegates through the basics of recorder technique before overseeing a group performance of ‘All Together Now’ by the ‘Fab Four’. The trip was Kate’s first visit to Spain and was part of a team building exercise inspired by OTD, who deliver development programmes to global brands in pharmaceuticals, cosmetics, electronics and sports retail. “I was approached by OTD with the idea of incorporating a music lesson into a development workshop. I thought the project sounded unique, especially as it was in Spain and delivered to people who had never read music before. With their headquarters in Birmingham’s Jewellery Quarter, OTD was established a decade ago by business partners Andy Crotty and Chris Cummins, who left behind established careers in the pharmaceutical industry to found a firm with a passion for inspiring people. “We’re delighted that Kate accepted our invitation to join us in Madrid and cannot praise her highly enough for the enthusiasm and professionalism in which she delivered the music workshop. Royal Birmingham Conservatoire is a world-class institution, providing exceptional training for the musicians, actors, stage managers and performers of the future. Its outstanding facilities attract the best and brightest students to Birmingham, along with internationally renowned performers and teachers. Kate is currently studying on Royal Birmingham Conservatoire’s MMus Instrumental Performance course. 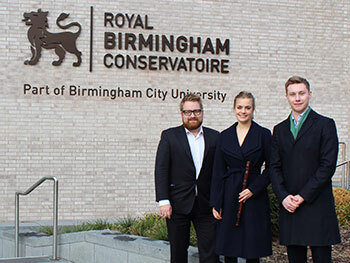 “As well as developing the talents of the next generation of great musicians, Royal Birmingham Conservatoire pays care and attention to musicians as entrepreneurs. We prepare our students for the opportunities and challenges presented by the future of the profession, with the intention that they leave us as employable music professionals. This exciting collaboration with OTD is one such example and working to a brief allowed Kate to think about the type of corporate commissions our students will be faced with once they graduate.